AARP discounts still one of the available options for seniors to save money on almost everything from insurance to cellular service. People over 50 can get AARP membership and enjoy AARP cell phone plans discount or AARP phones for Senior Citizens and sometimes can get discounts on both the phone and the wireless service. Here we’ll preview the AARP cell phone discounts from reliable cell phone service providers such as Consumer Cellular, AT&T Wireless, and Cricket Wireless. Also, we’ll tell you how to get discounts from Verizon Wireless, and will declare many facts of the AARP Jitterbug phone. People aged 50 and older can get AARP discounts on cell phones, cell phone accessories, and even the cell phone plans. Some of the service providers like Cricket, AT&T, Great Call, Sprint, and Consumer Cellular offer exclusive discounts for AARP members. Check out the AARP Sprint discount. AARP is the American Association of Retired Persons, which is a nonprofit organization. It was founded in 1958, and based in Washington, DC to advocate for the interests of 50 years and older people. It informs and promotes services and products with benefits for older people and seniors. This organization aims to improve over 50 years peoples' life, day by day AARP successes to be a reliable source for information about the senior's discounts and needs. As cell phones became an important tool to improve seniors' lives and keep them safer by calling for help in emergency cases, we will focus on AARP cell phone discounts as a great option to reduce spending on cell phones. AARP membership is a real and trusted way to save money. You can get the membership and join more than 37 million members; you can get it for less than $16 if you are in the US, if you are in Canada you will pay only $17. Consumer Cellular is the most famous company offers AARP phone discounts for AARP members. As known Consumer Cellular provides cell phone plans for seniors that start as little as $10 and also offers Doro senior friendly cell phones. As Consumer Cellular cares about seniors' needs, it also offers discounts for AARP members. You can get a 5 % discount on the monthly cell phone plans fees, 30% on cell phone accessories and extend the money back guarantee for 45 days. AARP AT&T senior discount is a 10% discount on the monthly wireless charges and doesn’t apply to the unlimited plans, overages fees, and shared plans with data packages less than 300 MB per month. Also, AARP members can get another 15% discount on specific cell phone accessories. For more information, you can visit att.com/aarp. Sprint offers discounts for AARP members through a Sprint discount program, to get it you have to fill out the forms for a Sprint discount program on the Sprint website. If you are eligible, you will get the discount, and your contract with Sprint will automatically extend by two years. Cricket Wireless offers $20 Visa promotion card for AARP members when buying a new smartphone from Cricket. You should follow some instruction to get the Visa promotion card via mail-in rebate: You have to buy the new phone from Cricket exclusive retail locations, Cricket online shop, Cricket stores, or Cricket authorized dealer. Fill-in and postmark the rebate form within sixty days of the phone activation. Your AARP membership should be active during the rebate processing time. New customers are eligible when buying the first phone, and current customers are qualified when upgrading their phones (every 24 months). Up to five lines of service per one AARP member ID can get the AARP phone deal. Like Consumer Cellular, the Jitterbug company which called GreatCall, specializes in the senior citizen’s market and offers the Jitterbug phones for seniors and also offers simple cell phone plans for seniors. For the current time, there’s no AARP Jitterbug phone or plans discounts, but the AARP organization recommends the GreatCall’s health and safety mobile applications (which work with the Jitterbug cell phones and smartphones ). 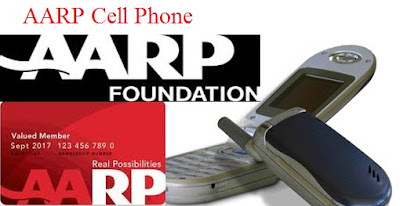 Discounts on the AARP cell phones for seniors can help senior citizens to decrease phones monthly fees when communicating with their family, friends and when using their cell phones for safety and health care purposes. Finally we can say the AARP cell phones are highly recommended.